Entering its 55th year of publication, the Sentinel seeks to present the student body with current and thoughtful articles regarding school, local, and world events. The Sentinel is a student-run newspaper that combines the talents of its staff to produce editions that meet the highest standards of scholastic print media. The Sentinel’s staff members are enrolled in the Journalism II course. Students prepare for participation on the newspaper by enrolling in Journalism 1. 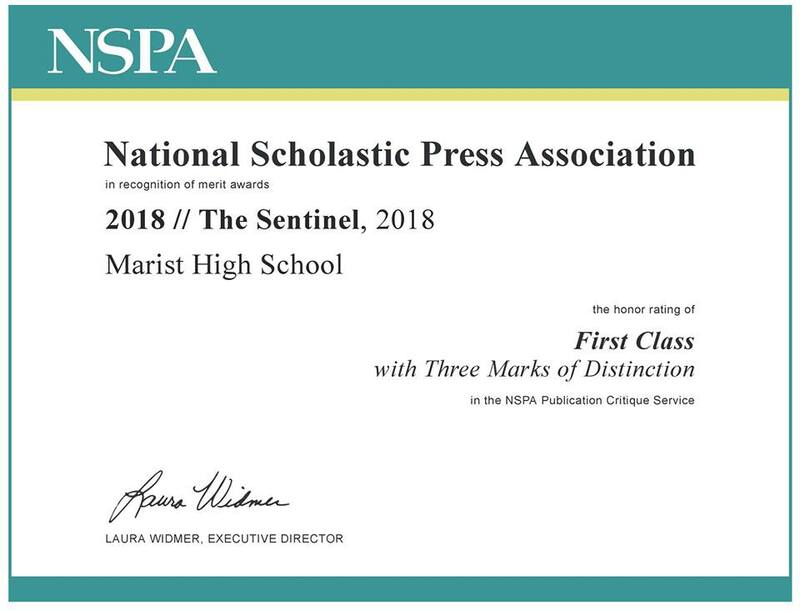 During the 2017-2018 school year, the Sentinel earned national, state and local awards for excellence, including a first place from the American Scholastic Press Association, a first class rating with three marks of distinction from the National Scholastic Press Association and a superior rating from the Scholastic Press Association of Chicago for overall newspaper. Six RedHawk journalists emerged from the 2018 IHSA sectionals and advanced to state, including senior Georgia Lattas (sectional champion in copy editing), senior Gina Musso (2nd place-copy writing) and senior Emma Brown (2nd place-review writing). Senior Cecelia Gibbons placed 5th in editorial writing at sectionals and senior Jenna Fessler placed 6th in photography. Since 2011, a total of 26 RedHawk journalists have advanced to the IHSA journalism state final competition. A number of RedHawk journalists have also won or placed in competitions hosted throughout the school year by the IJEA, SPAC and the Illinois Women’s Press Association. Gianna Miritello ’18 was named the the Illinois Journalism Education Association’s 2018 All-State Journalism Team. Solomon Davis ‘16 was named the 2016 Chicago High School Journalist of the Year by the McCormick Foundation and the Scholastic Press Association of Chicago. Davis was also one of 15 students from Illinois named to the Illinois Journalism Education Association 2016 All-State Journalism Team. The Sentinel is advised by Mr. John J. Gonczy, who is a certified journalism educator through the Journalism Education Association (JEA). Gonczy is president of the IJEA, past president and current secretary of the Scholastic Press Association of Chicago and a member of the IHSA journalism advisory committee. In 2005, Gonczy received the JEA’s “Rising Star Award” for excellence in advising, the only Catholic high school teacher in the nation to win the honor that year. Gonczy is also a 2010 Golden Apple award finalist.